They're on! 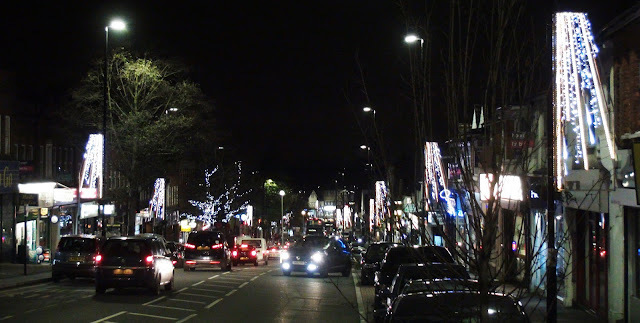 Central Road's Christmas lights were switched on on Thursday. There were a few teething difficulties with a some sets of lights not working but over the last few evenings, thanks to the persistence of Tracy from the traders association, Martin from Worcester Spark and Cllr Arthur Hookway, most of the dark patches seem to have been ironed out. Mind you coming past at dusk this evening there was a solitary lamp post all lit up but that's the way with separate timers - getting them all in sync is never going to going to be perfect. There was particular pressure on the council this year to ensure Central Road's Christmas lights lived up to expectations after the less than perfect performance last year. Cllr Hookway has been quite persistent, reiterating at several meetings I've attended throughout the year that this year's Christmas light must all be working and on before our Christmas Late Night (this coming Friday - 11th December) and they do look to have come through with the goods.